T.G.I.F. after being away from everything for 2 weeks this have been a busy week. I'm still not caught up on all commenting, please give me a few days and I will be. I was moving some stuff the other day and ran across a sweat shirt I forgot I bought to embroidery something on it for Corbin. 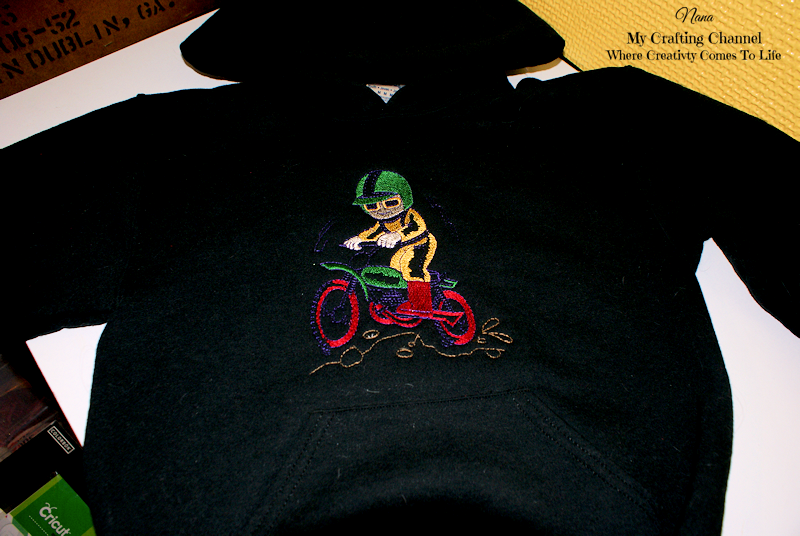 He is all into Dirt Bikes this year and he is getting one for Christmas or his birthday in January so that is what I embroidered on the shirt. All the colors seem to pop except for the purple. He want card he will just be happy to receive it. AWE-SOME!!! Corbin is going to LOVE it! You did a fantastic job! aaaw, super cute hoodie! He is gonna love it:) GREAT job! Super cute & COOL!!! AWESOME job!! WOW This is awesome, Nana!!!! Have a great day. Oh wow Nana Corbin will love this, it is a special gift just to have it from you.